MONTE CARLO, MONACO / ACCESSWIRE / December 4, 2018 / And... The winner of Best STO award at the Monaco International Blockchain event is... Vid. These words were music to the ears of the whole Vid team who have been working tirelessly on their project. 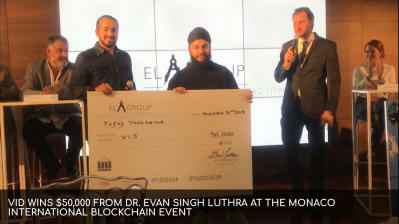 The announcement was followed by an award of USD $50,000 in prize money from Dr. Evan Singh Luthra, Founder of EL Group International, with Evan also choosing to join the team as an advisor after being thoroughly impressed by the project and its ambitious vision. What is Vid? Vid is an extension to the human memory. As humans, we are all Nostalgic; we all have a "Wistful desire to return in thought or in fact to a former time in one's life, to one's home or homeland, or to one's family and friends; a sentimental yearning for the happiness of a former place or home". What do you remember from this day last year? What if you could remember everything? Imagine having access to every possible memory, moment and feeling at your fingertips. What do we do in order to capture a memory? We take a picture or video. Irrespective of how the memory is captured, all of our memories already exist in the form of consumer data. Vid has built and patented a way to auto generate video memories from this data and create personalised digital journals. Jag Singh, the co-founder and CEO of Vid was quoted during his pitch at the event where he stated "Vid is essentially like plugging a hard drive straight into your brain, with all of your memories organized, searchable and permanent. We're creating a new market. No one has ever thought beyond capturing and sharing the highlights of your life. Why not remember everything? Especially when Vid can seamlessly do it all for you. Vid is pioneering the paradigm of memory extension and memory media." Vid acknowledges and appreciates the delicacy of personal data and as a result, all private memories will be secured with zero knowledge encryption. The user will have complete autonomy over their personal data meaning the ownership and accessibility of their memories will be in their hands. Vid doesn't just allow users to revisit their memories, Vid have built complex patented AI editing into the app for public memories users want to share with their friends. The user simply uploads their raw clips and the Vid app produces a high quality edited piece of content from the users footage. Vid are conducting a Security Token Offering (STO) with the aim of raising USD $40 million dollars, their private sale just opened in Monte Carlo, Monaco.